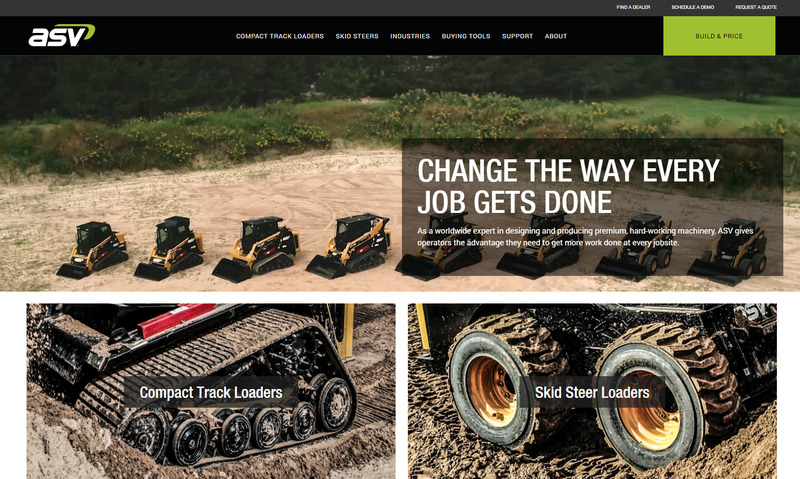 GRAND RAPIDS, Minn. (Feb. 12, 2019) — ASV Holdings Inc., a manufacturer of all-purpose and all-season compact track loaders and skid steers, has introduced a new brand strategy highlighting the product features and qualities that make ASV an industry leader and allow customers to get more done in more places. The company also launched a new website with features to improve customer experience and ease of use. The new brand highlights ASV’s mission to support customers by creating innovative, high quality equipment that company employees would want to operate themselves. The brand identity showcases the ways ASV machines offer more power, performance, reliability and productivity than ever before. All of those features are ultimately laid out with the introduction of the new website. Internet users can find the website at www.asvi.com. The site showcases the company’s new brand identity and highlights ASV’s competitive advantages and product strengths. It includes a streamlined look and gives users the ability to quickly find the information they’re looking for with its updated navigation tools. A new price quote tool allows potential customers to configure a machine with the features they desire and request a quote from their nearest dealer. In addition, the site includes a blog and newsletter sign-up section, providing easy access to product news and real-world success stories from ASV machine operators.